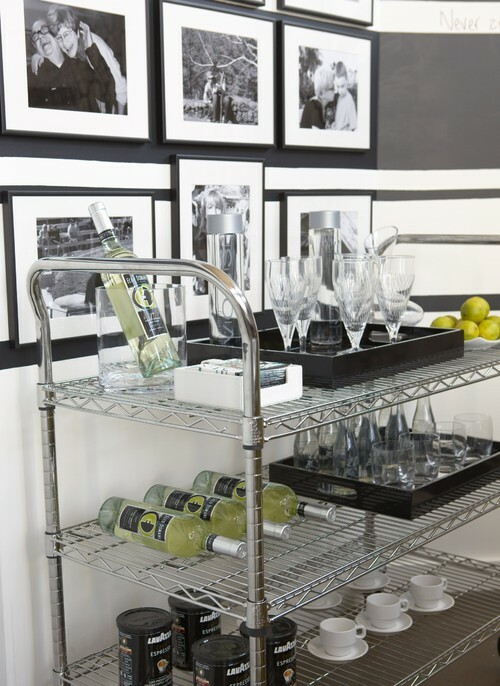 It can be tricky to push a cart loaded with bottles and glasses over a grassy lawn—but we still love bar carts! A bar cart makes it easy to wheel the staples of an open-air bar across the patio and put it right next to your lounge chair. The style of the bar cart is up to you—and there are lots of styles. Wooden carts range from antique to butcher block to farmhouse (with wooden wheels!) to tiki bar. Metal cart designs span from whimsical metalwork to industrial steel. A pitcher of ice water and a selection of sparkling water offers something for everyone. Fill an ice bucket, cap it with a tightly fitting lid, and remember to bring the ice tongs. Champagne on ice, vodka, gin, and whatever else your group’s preference includes. Tequila makes a great Bloody Maria, as we recently learned… Keep your liquors (not the champagne) in the freezer the night before to get a jump start on beating the heat. Save the colas for nighttime. For brunch or lunch entertaining, go with tonic water, club soda, orange juice, tomato juice, cranberry juice, and any other “light and fresh” mixers you prefer. A few classic picks give you a lot of options. Put fresh-cut lemons, limes, and oranges in their own bowls. Add celery, pepper, and olives for the savory crowd. Champagne flutes and tumblers are essential, but it’s always fun to mix in some funky glasses that can hold plenty of ice with style. Mason jars have been a favorite for the past few years—what’s next? We’ve been mixing day drinks in pint glasses lately (and nobody’s complained yet…). Trays make it easy for you to carry four drinks at a time from the cart to the table, the picnic blanket, or scattered chairs. Plates and napkins serve as a backup for people who go for seconds on the food you put out. Tuck a small vase in the corner to add color to your bar cart. You can go with colorful spring wildflowers, or a spray of ferns when they’re at their spring greenest. 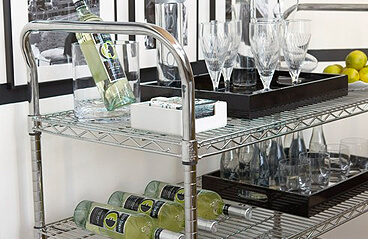 How do you stock your bar cart? Stop by our Facebook page and let us know!